Hearing loss is one of the most common conditions detected in children and infants. It’s estimated that hearing loss occurs in three out of every 1,000 babies born in the United States. Screenings begin at birth and should continue on a regular basis throughout life. Uncovering and addressing your child’s unique hearing loss and the best solution is vital for their continued development and well being. Pediatric Audiology is an essential part of your child’s healthcare, and no child is too young to have a hearing evaluation. We work to ensure your child’s access to the best hearing care possible. 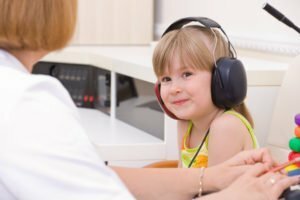 At Hearing Resources Audiology Center, we offer you and your child comprehensive pediatric audiology care from birth and throughout their childhood. Friendly, accessible information regarding your rights as parents and your child’s rights under the law as it relates to hearing access. We help you advocate for your child. Tympanometry – The testing of the middle ear and eardrum by creating variations of air pressure in the ear canal. This can determine if there is a blockage impeding sound. Acoustic Reflexes – The testing of the neural loop – testing the integrity of the connections between the inner ear to the brain stem, and back to the middle ear system. This test looks very similar to Tympanometry, but is testing a different part of your child’s hearing anatomy. Otoacoustic Emissions – A test involving the cochlea, recording the motion of the cochlea’s sensory hair cells as they respond to auditory stimulation. A small probe tip is placed in the ear canal. The response to sounds is then recorded. Behavioral Audiometry: For infants aged birth to six-eight months old – how your baby responds to sounds, such as startling or turning their head, is recorded and analyzed. Conditioned Play: For toddlers and preschoolers, aged two to four, your child is trained to perform an activity when a sound is heard. We commonly refer to this type of testing as a “sound game.” Once your child learns how to “play,” testing gets underway. Conventional Audiometry: For children aged five and older, your child raises their hand or gives a verbal response when they hear the sound stimulus. Need help deciding if testing is right for your child? Read our page: Does my child need a hearing evaluation? At Hearing Resources Audiology Center, we strive to make you and your child feel relaxed and comfortable throughout your visit with us. Anna-Liisa, our Patient Advocate, will greet you and have your benefits information available to you if you have provided insurance information prior to arriving. Toys and books are available to help put you and your child at ease, and you can participate with your child to ensure the best experience possible. We promise to be patient and listen to you and your child to help obtain the most accurate results. To us, your experience with Hearing Resources is more than an appointment; it’s a relationship. We are here to answer any questions you have about our pediatric audiology services. Want to learn more? Visit How’s Your Hearing, a site provided by the American Academy of Audiology. We are here to help! You are not alone, and we can answer your questions about your child’s hearing health. Call us at 503-774-3668 and schedule your child’s hearing evaluation with us today.